Quinn (left, died 5/3/01), Ziggy (top, died 5/5/00), and Fair (died 4/17/01) in my 50 gallon tank, 11/6/97. I no longer had any indoor goldfish (until the fantails mentioned on my current indoor goldfish page) after Quinn died on 5/3/01. The 50 gallon tank was disinfected and set back up for other fish. I would no longer have indoor goldfish (until the fantail). Below is information on the goldfish that I did have. They all died unexpectedly from tuberculosis which they had been carrying for years with no problem. They all developed severe bloating or dropsy right before dying several weeks apart. 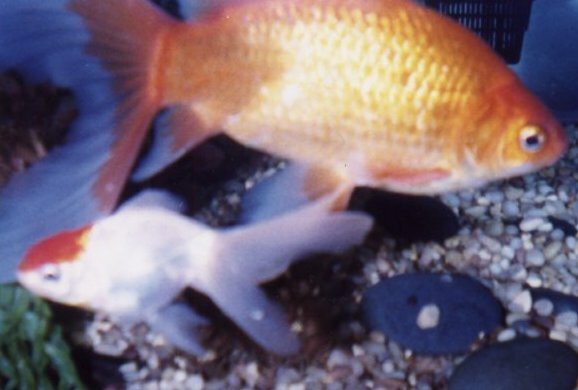 When there were four goldfish (1997 to 2000), they all got excited by each other and chased each other in their attempts to spawn even though none were a female full of eggs. Quinn on 4/22/01. Note the bloody, lumpy growth (probably tuberculosis related) on his tail that had been there for almost a year. He developed dropsy too (it got severe the following week of the photo). You can also see the drastic color change he underwent since the 1997 photo above. Such changes are typical and normal for goldfish. Because he was half white, Quinn was considered a defective blue oranda. 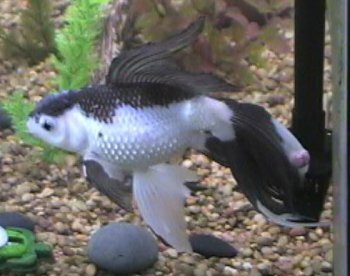 Quinn - born around 1994-5, bought on 12/16/96, 8 inches, blue oranda male, died 5/3/01. Wade - born around 1995, bought on 12/16/96, died 4/12/01, 6 inches, calico oranda male? (male behavior and maybe some tubercles (not more than two); I only assumed to be female before since the males devoured all of Wade's fins off and tend to chase him/her). Wade lost most of her caudal fins from the male goldfish. She then developed swim bladder problems and could no longer swim upright. She spent the last four months or so of her life upside down on the surface. She still managed to eat some. She developed a huge tumor on her side that was most likely tuberculosis but could have been another internal bacterial infection or even a cancerous tumor. Her scales later bulged out and her oranda hood swelled up too. She was reduced to about 4 inches long with no tail. Treatments with antibiotics, medicated food, Melafix, and salt were to no avail. Ziggy - born around 1996-7, bought on 10/6/97, died 5/5/00 of a tuberculosis infection, 6 inches at death (3 inches tail, 3 inches body), red cap oranda male. See my 50 gallon tank page to learn what was in their 50 gallon tank. 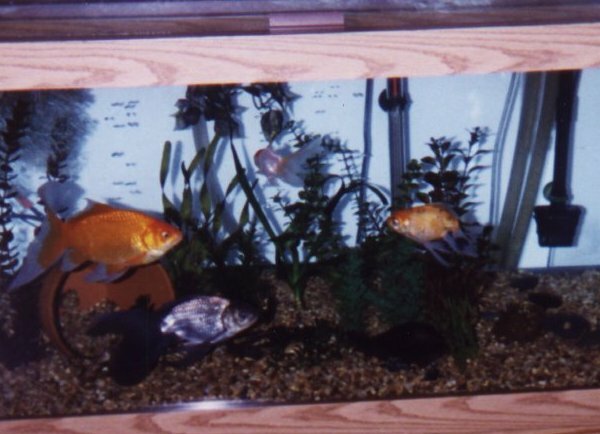 Three goldfish - Quinn (left, died 5/3/01), Ziggy (top, died 5/5/00), and Fair (died 4/17/01) in my 50 gallon tank, 11/6/97. Fair, Quinn, Ziggy, and Wade - left to right, 9/27/08. Ziggy is the tiny one at the top that is hard to see. Fair (top) and Ziggy - 9/27/08.